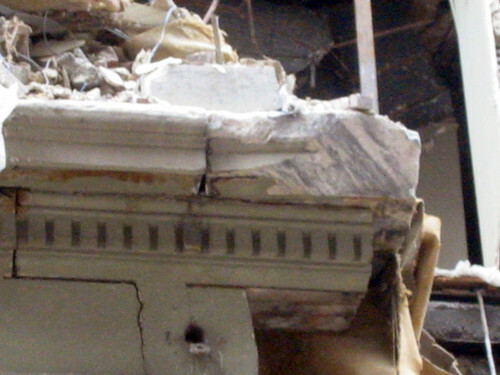 As this bitter cold and snowy February draws to a close I was reminded a few times that the last of Century Building fell ten years ago this month. In early February 2005, I was sitting in the small conference room of Pyramid Companies offices on the 6th floor of the Frisco Building when conversation was suddenly interrupted by a gigantic crash followed by a few screams. I knew it could only be one thing. 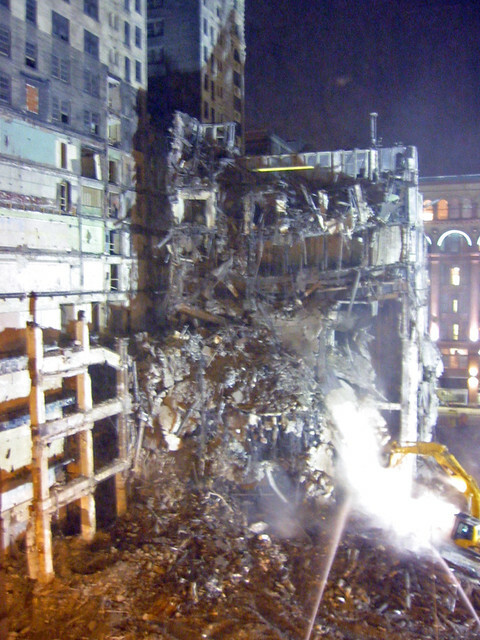 Like a giant game of Jenga, the last remains of the Century Building had fallen. We went running out of the room into the open office where everyone by now was crowded at the windows staring into the giant cloud of dust that had engulfed Olive Street. 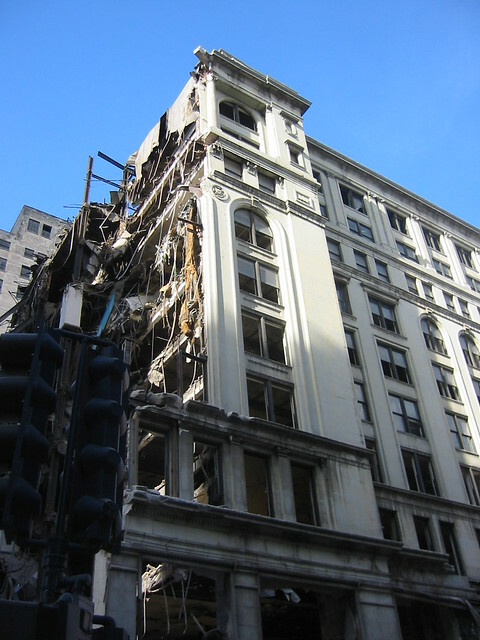 The photo above is from October 2004 as demolition began. Late December 2004... a holiday season to forget. Veins of grey and white Georgia marble revealed the beauty that had been covered with layers of paint. The facades of the Century were entirely clad with solid blocks marble. 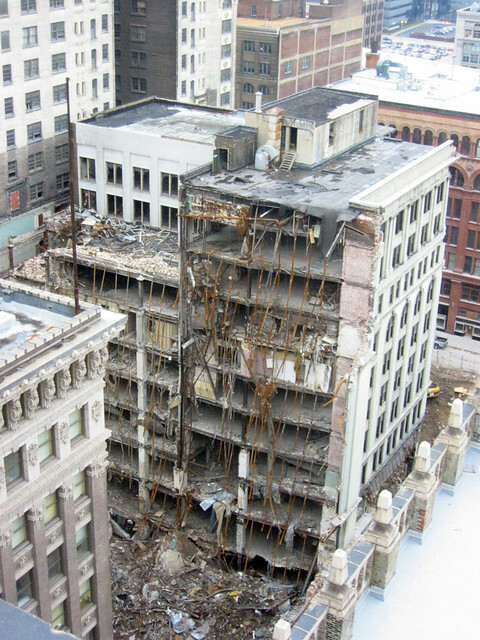 A view of the destruction from the top of the Paul Brown Building, which at the same time was being transformed by Pyramid into loft apartments. Near the end in early February 2005. 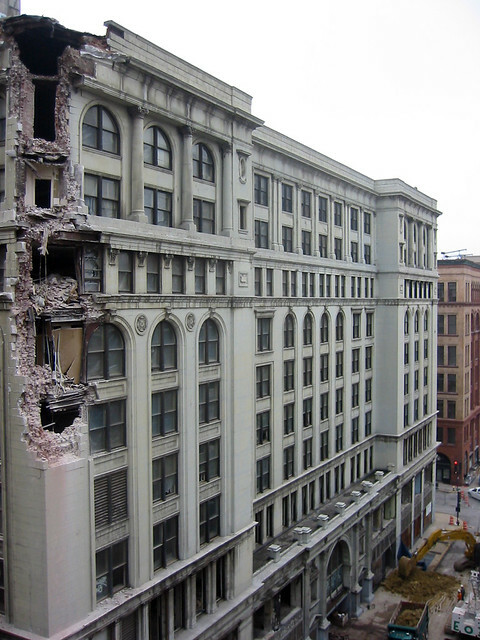 More demolition and pre-demolition photos can be found here on Built St. Louis. 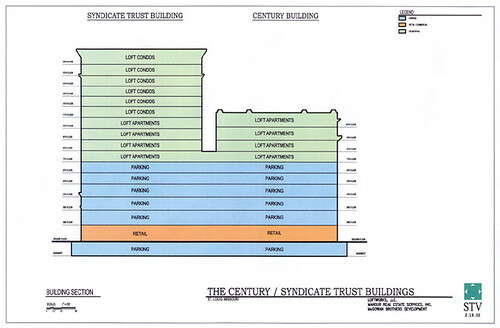 Craig Heller had proposed a compromise that would save the Century and provide almost 700 parking spaces in the basement and lower floors of the Century and adjoining Syndicate Trust, but the powers that be would have nothing to do with this great idea. Ten years later the upper half of the Garage Mahal that went up in place of the Century sits mostly empty on a daily basis. 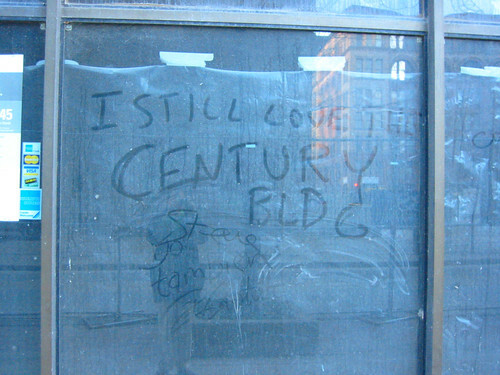 Shortly before the construction fence went up around the Paul Brown to start the renovation, someone scrawled this on a dusty storefront window. It remains to be seen whether the demolition of the Century in 2004-2005 will continue to hod the title of the greatest crime against architecture in this century. This is the first thing I thought of when I saw the site plan for the proposed new NFL stadium on the North Riverfront announced in early January by David Peacock and Robert Blitz of the St. Louis NFL Task Force. I immediately started thinking of an alternative plan for a new stadium that doesn't require such wanton destruction. 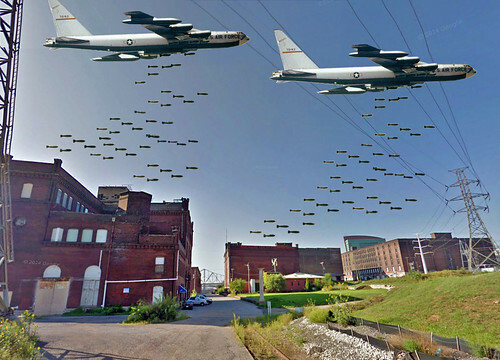 As currently proposed, the stadium and its surrounding sea of surface parking lots, walkways and parking structures would completely wipe out the North Riverfront Industrial Historic District with exception of the Ashley Street Power Plant, which is still used by Trigen to feed the Downtown St. Louis steam loop. Also to be demolished would be the south half of the North Broadway Wholesale & Warehouse Historic District including Shady Jack's Saloon as well as Farmworks, a transitional housing development by Craig Heller and the Cotton Belt Freight Depot, both individual National Register historic properties. An aerial view of the historic districts and individual National Register historic buildings (outlined in red) that would be demolished by the current stadium proposal (outlined in yellow). Below is a graphic provided by the NFL Task Force that overlays the stadium over the existing context of the North Riverfront. I have highlighted the buildings that would be demolished. 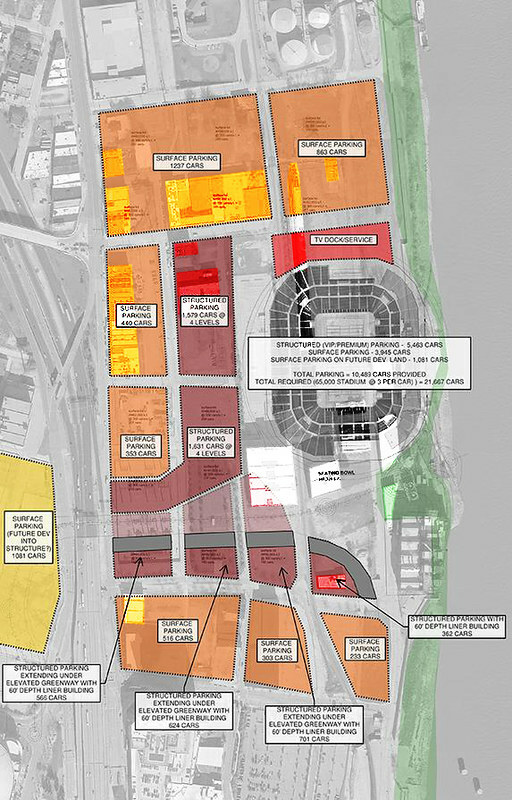 The alternative plan would build the same open air stadium as proposed by the NFL Task Force, but would simply move it just south of the Ashley Street Power Plant and across 2nd Street from Lumiere Casino and the Four Seasons Hotel. Loading and services would access the stadium via Leonor K Sullivan from the south and Lewis Street from the north under a pedestrian promenade that would extend all the way around the stadium and out over the river. The existing railroad tracks would also be re-routed on a new trestle around the east side of the stadium (the current plan re-routes the tracks west of the stadium). 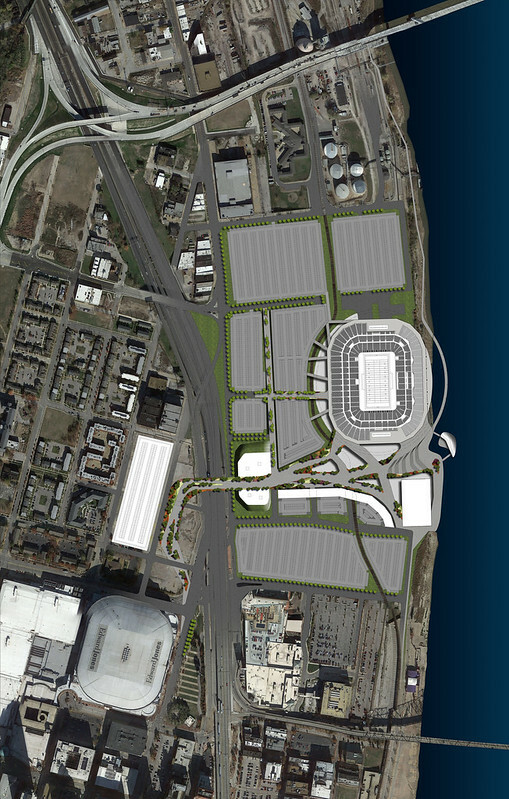 This stadium plan would not only significantly reduce the $90-$110 million estimated budget for demolition, environmental remediation and land purchase, but by moving it 1,600 feet south, would also better integrate the stadium with Downtown St. Louis and Lacledes Landing, positioning it to better take advantage of MetroLink and the plethora of existing parking infrastructure that is already present near the Edward Jones Dome. The south end of the alternate stadium location would be only about 1,125 feet from the Lacledes Landing MetroLink station, well within the 1/4 mile considered to be a comfortable walk. The current planned location would be 2,725 feet or over over a half mile from the station, which could deter some from taking the train. 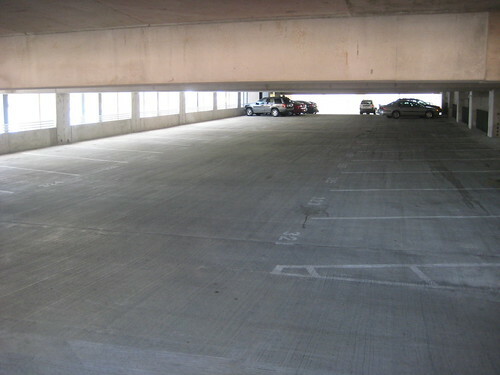 The same goes for existing parking infrastructure. Why waste millions of dollars duplicating existing parking spaces when a closer stadium location would put existing garages near the Edward Jones Dome and some garages in the Central Business District, including the large garage at Broadway & Locust and the MX Garage (former St. Louis Centre) nearly as close or closer than the Kiener East & West Garages are to the Dome? Locating the stadium nearly 1/3 mile farther north would leave garages in the CBD sitting largely empty, not to mention the area restaurants that currently fill with fans before and after football games, and other events at the Dome. Similar to the present proposal, the alternate plan would include some new structured parking with mixed use buildings built around the perimeter. Locating these farther south as well would allow them to be better utilized on a regular basis, serving Lacledes Landing, Lumiere Place and events at the convention center. 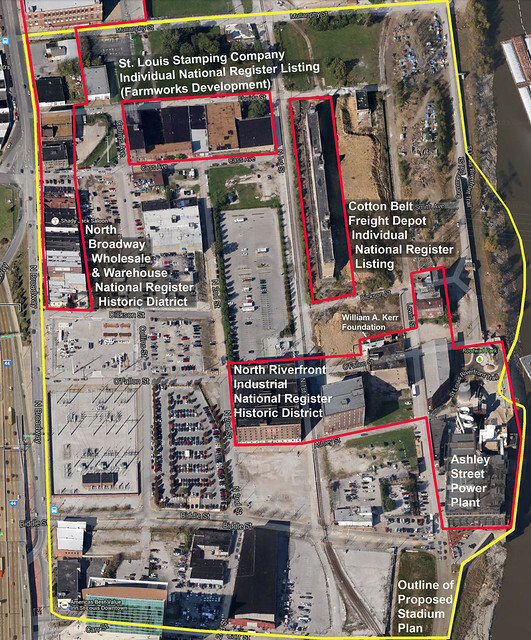 Locating the stadium just east of Lumiere Place could also help jump-start redevelopment of several historic buildings in the North Riverfront Industrial Historic District as well as the Cotton Belt building. Using Historic Tax Credits, these buildings could become residential and office lofts with ground floor spaces for restaurants, bars and other commercial uses... instead of becoming landfill. Shapleigh Hardware Warehouse #3 built in 1903 & 1906 fills the entire block between 1st, 2nd, Ashley and O'Fallon Streets. 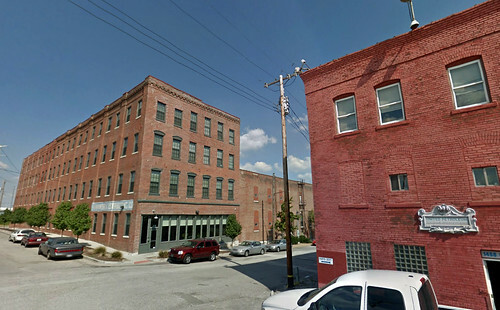 This view showing window detailing similar to some of the Cupples warehouses is along Ashley looking toward the river. 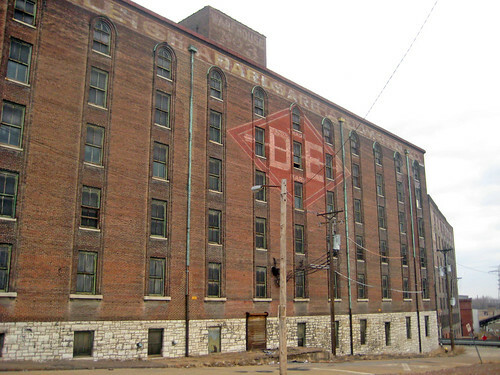 Just beyond is a smaller 6 story warehouse built in 1903 for the Beck & Corbitt Iron Company. Looking east on O'Fallon Street, the small building on the left was built in 1894 for the Belcher Water Bath Company in 1894 and is now the home of the William A. Kerr Foundation. Rehabilitation of the building in 2004 for the foundation achieved LEED Platinum Certification and includes a plethora of green building features including a green roof. It wouldn't be very sustainable to bulldoze it into the ground now, would it? Photo from the Kerr Foundation website. 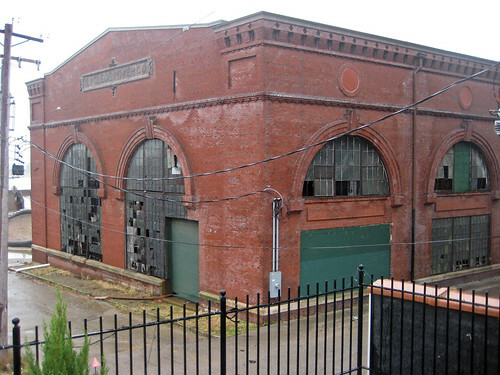 The Laclede Power Company Building was built in 1901 at Lewis and O'Fallon Streets just north of the Ashley Street Power Plant and was later used by Union Electric for electricity generation. 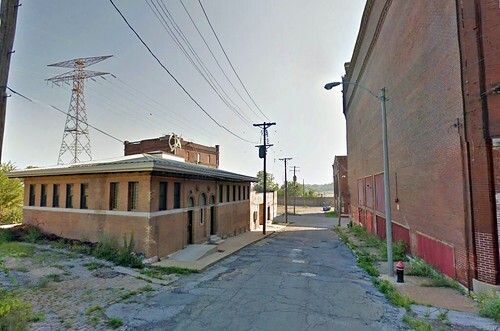 More recently, in the mid 2000's, Trailnet proposed renovating the building as a multi-use facility that would include a trailhead for the North Riverfront Trail, a restaurant, bike shop, event and office space. Unfortunately the project was not completed. 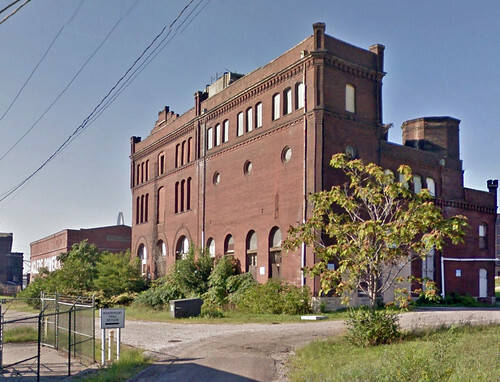 This castle-like building was built in 1900 for the St. Louis Cold Storage Company at 1312-22 Lewis Street. It is one of several buildings in the district that has been proposed for residential rehabilitation in the last dozen years, but still waits. 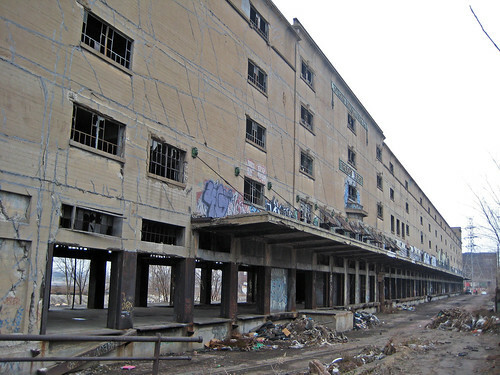 Measuring 750 in length, the massive Cotton Belt Freight Depot Building was built adjacent to the Cotton Belt Line railroad in 1913 entirely of site-formed concrete. Although still vacant, the building has been used for the last dozen years for the annual Artica arts festival. 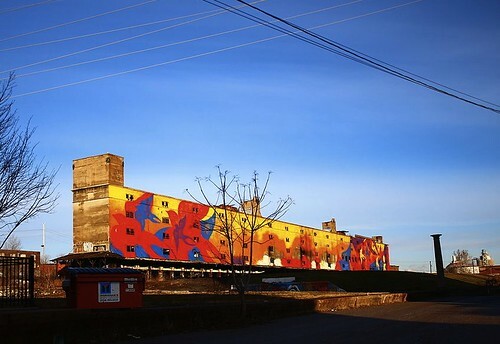 The east side of the Cotten Belt Building was recently transformed into a giant mural called Migrate, which is highly visible to drivers crossing the new Stan Musial Veterans Memorial Bridge. 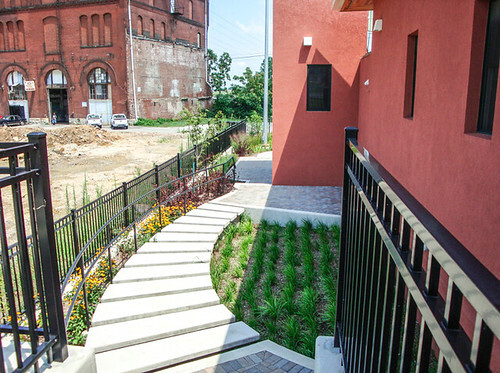 Developed by Craig Heller's Loftworks, FarmWorks is a multi-use facility that streches across five buildings along Cass Avenue between 1st Street and Collins Avenue. 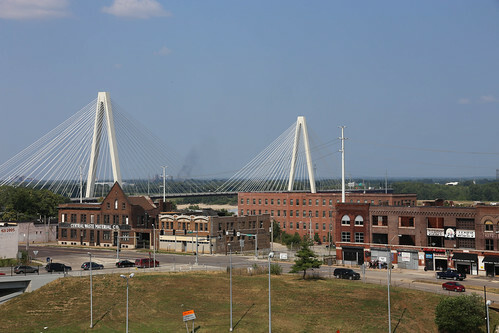 It includes the St. Louis Stamping Lofts, which provides transitional housing with supportive services and job training, and urban farm with indoor and outdoor growing facilities, a green business incubator focusing on locally grown foods, an educational facility, an anaerobic digester that turns food waste into methane, and a CNG fueling station. 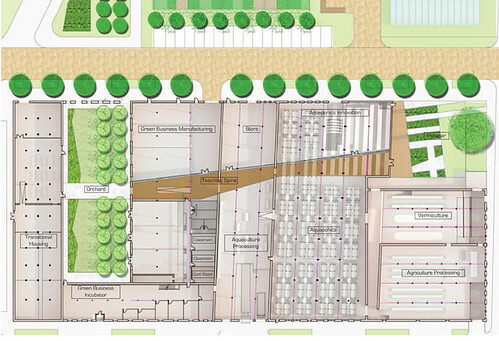 A floor plan rendering of FarmWorks from their website.